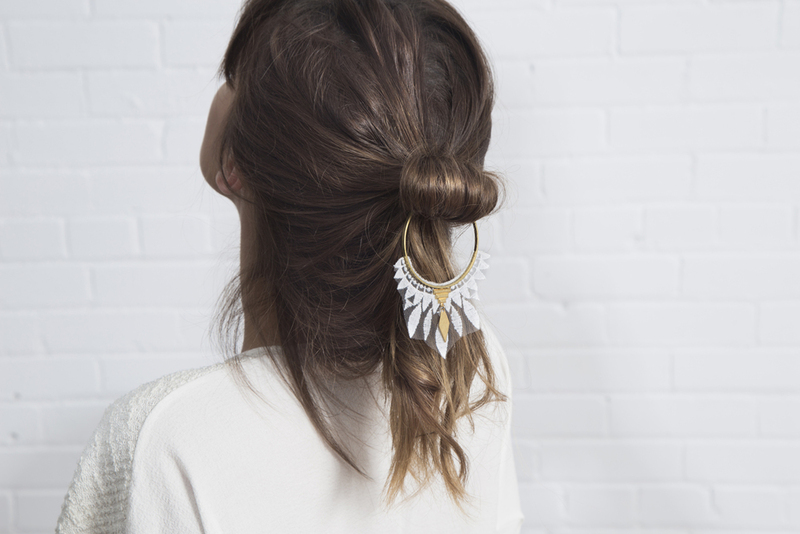 Summer Awakening is a jewellery collection built in three parts. From the first pure white cold light of the morning sun to the late dark warmth of sunset moving into the dark indigo sky of the short nights, This Ilk's latest collection is inspired by the Summer light. Exploring bright whites, denim, deep burgundy, violets and midnight blues by mixing vintage hand dyed lace with other rare findings, the jewelry collection can soften Scandinavian minimalism or toughen a bohemian free spirit. Denim fringe, high quality and handmade tassels as well as vintage lace add a 70's touch to modern and exotic shapes. Éveil Estival est une collection de bijoux créée en trois parties. De la première lueur de soleil frais du matin aux couleurs chaudes et sombres de son couché, en terminant avec le ciel dégagé des courtes nuits d'été, la dernière collection de This Ilk s'inspire de la lumière estivale. Sa palette inclue le blanc, bleu, bourgogne, violet et indigo. Composée de frange de denim, de pompons haut de gamme, de dentelle vintage et autres trouvailles majoritairement de source vintage, nous y percevons une influence des années soixante-dix.